If you’re looking for a great full body exercise, you’d be hard-pressed to find one better than the Turkish get-up. Turkish get-ups involve full-body strength, flexibility and coordination in a way that few other movements offer. They’re especially good for your shoulders and core, and they can have functional carryover for handstands and handstand push-ups. If you’re new to this exercise, start with no weight or use a very light weight until you get a feel for the movement pattern. Some people will get it quicker than others, so be patient if you struggle at first. Remember, it’s always beneficial to have one-on-one instruction from an experienced personal trainer when learning a difficult new exercise. Originally developed as a military technique for self defense, the Turkish get-up has become a viable tool for athletes and strongmen of all kinds. The lift involves moving from a position where you are flat on your back into a full standing position, the whole time keeping a weight extended above you in one hand. Though there are a few different variations on specific techniques, the classic Turkish get-up starts with the lifter bending the leg on the same side where the weight is being held. That foot is used for leverage to roll the torso up onto the opposite hip and elbow. From here, roll onto your palm, bridge your hips, and drag the far leg under your body. Complete the move by standing up just like you were coming up out of a lunge. Make sure you keep the arm holding the weight straight during the entire lift. Think about actively pressing through that shoulder the whole time. Keep your eyes on the weight, maintaining a tight grip with your arm vertical. Once you get to a standing position, you’ll need to return to the ground to complete the lift. Take it slow and controlled. Sometimes getting down can be harder than getting up! Don’t worry about going for high reps on these, a few at a time is plenty. You might be surprised how quickly you’ll fatigue, even with a light weight. As always, form first! Thanks to Nimble Fitness for letting me shoot this video in their facility. One of my favorite exercises! By the way, awesome site. You and your videos make me smile and are totally inspiring. WHAAAATT?? Turkish Get Ups with a barbell? I know what I’m doing tomorrow! Right on, Jim! The full length Olympic bar adds a whole new dimension to the balance. I saw this mentioned in Tim Ferris’s “The 4-Hour Body”. I think your form looks pretty spot on. It must be great for core and stabilization. Thanks, Max. It is definitely a good core exercise! I tried my first Turkish Get Up only a few days ago and I used a barbell for good measure. I must say I feel a little daunted about lifting half my bodyweight being that im 102kg (224lbs), but im always up for a challenge! Don’t be in a rush to go heavy on these, Daniel. I can’t do much more than 50% of my weight and I’ve been training these on and off for years. Plus I only weigh 160 lbs! got it! 50kgs. It took some effort but i got there. Only thing is 50kgs is the biggest we go to in my gym! Congrats – that was fast! You could try using a barbell, then you could add as much weight as you want. Thanks! It’s always nice to get positive feedback! 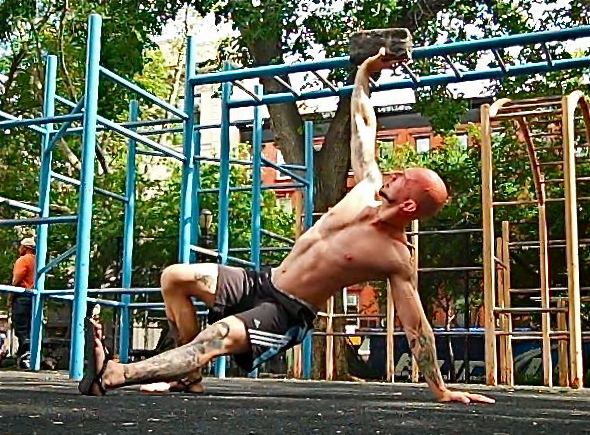 I did these recently with 1/3 of my bodyweight (barbell) and it was extremely challenging! It’s a very good exercise but so tiring that I dread when it comes up during my crossfit classes. 🙂 I still have quite a way to go towards 50% of my bodyweight. Thanks for this article, always a good read. Yeah these are really tough – 1/3 BW with a bar is very good though. Keep training hard! moms do this a fair bit, except that you’re usually holding a sleeping infant who is somewhat attached to your breast so that the head is supported, and you have to move fast because you have to pee, and having recently had a baby, it sneaks up on you really, really fast, so it also involves some cardio. this is a good one. I hadn’t thought of it in a while! Haha – yeah it’s definitely a functional movement! Great demo Al – No nonsense and right to the point of how to do the exercise. 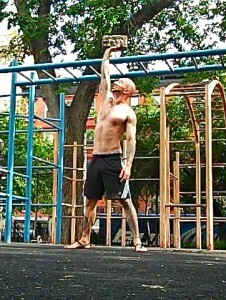 I think I will add the Turkish Get Ups as a finishing movement at the end of my workouts. Keep up the good work! Thanks, Nathaniel! This is a tough exercise to do at the end of a workout, but it’ll definitely finish the job if you’re not exhausted after your other exercises. Hey AL, I love TGUs! Many of my clients are short on time when it comes to dedicating to exercise, so the TGU is often one of the exercises I prescribe to these people. They work the entire body in terms of strength and stabilization, and it even acts as a sort of metabolic resistance training activity so the heart really gets pumping. These are not easy, but with the right instruction, anyone can do them. Hey Susan – It’s always good to hear from a lady who does Turkish get-ups! Keep spreading the word about this great exercise. us readers! More power to your site. Hey Al, very good demonstration. After I discovered your site, almost all of the questions on my mind is solved from the informations I read on your site so far. I infact, however I am not a professional, was able to make a work out program on my own from the exercises you show and starting to take benefits. And this one will be a part of my work out program no doubt! Thanks. Thanks, Anil! I’m glad you’ve been learning a lot from my blog. You don’t need to be a trainer to design a workout for yourself. Keep up the good work! What kind of a rep count should I shoot for doing these? Is it better to add more weight and only do 1 or 2 for each side or keep it lighter and do more? It depends on what your objective is, Billy. If you’re just going for strength a couple reps per side is fine. If you want stamina, stick with a more manageable weight and go for 10 or more on each side. yikes…this exercise looks manageable but i could totally see someone messing up their shoulder or dropping a weight on themselves because they were overzealous and went too heavy…of course i suppose that’s a risk when you lift a heavy weight in any manner, but this looks particularly risky…then again this is clearly a challenging exercise even with a relatively light weight, so as long as the trainee is mindful of all that this does look like quite a beneficial movement..i would definitely consider it if i used weights, especially since all i have at home is dumbbells, the heaviest of which is 40 pounds. Hey Robby – There’s always some degree of risk to anything. 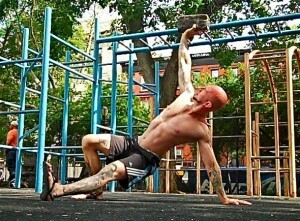 A foolish person is likely to get hurt just lifting their own bodyweight. People have gotten injured doing pull-ups, but they’re still one of the best exercises out there. I stand by the Turkish Get-up as one of the best weight training exercises, but like I said above, beginners would be best to ease in with a light weight (or no weight at all). Well said; I think knowing and respecting your limitations is one of the most crucial aspects in transcending them. Sure, training hard is key, but I believe it was in ‘A Zen Approach to Everday Fitness’ that you said something along the lines of “train smart *and* hard”. Training hard won’t do you much good if you end up with an injury that prohibits you from training for several weeks!